Irish Red and White Setter Temperament: Can You Keep Up? 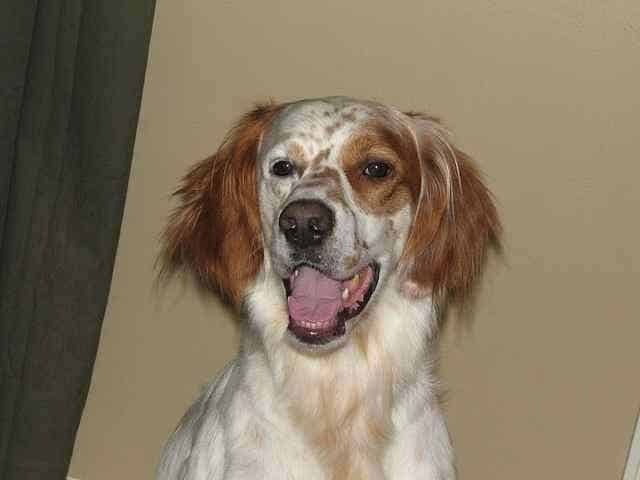 Irish Red and White Setter Temperament (Energetic, Playful): Can You Keep Up? The Irish Red and White Setter temperament will make you wonder when the battery will ever run out. This is not a dog that enjoys being cooped up indoors. For the sake of both of your sanities, exercise him well and often. 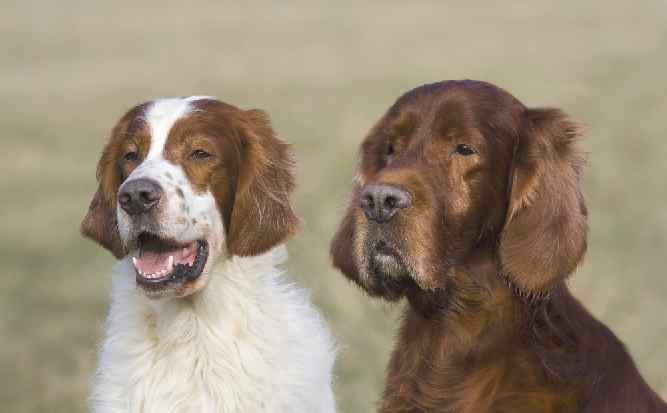 There are six traits that you need to know about the Irish Red and White Setter temperament. Pro Tip: If you’re not into daily exercise, and lots of it, then this is not the breed for you. He is devoted to his family, and he loves spending time with them. This is one of those dogs that will start to show signs of separation anxiety if left alone for too long. What this means is that he may destroy your stuff when you’re gone for too long. Or he may act out when you come home and become destructive or not willing to listen. Therefore, if you have a busy schedule that requires you to be away from home for long periods of time, then this is probably not the best dog for you. You can tell what kind of family dog the Red and White is going to be from how he acts as a hunter’s companion. He is very loyal to his people. He never strays too far from his hunter. He’s a curious dog, and he’ll do what he needs to do to cover some ground, but he never loses sight of his people or wanders too far without knowing what he’s doing. The Red and White is affectionate both with people and with other dogs. He can even grow to love cats, so long as you raise him with them. Keep in mind, though, that his breed does not, on average, do well with cats, so you may still have some trouble. As a sporting dog, the Red and White has enough energy to spare some, so it’s important that you exercise him well every day. Once he’s older and his limbs have finished developing, you can, and should, push him (and yourself!) to the very limit every day. Play fetch with him until you physically can’t anymore on weekdays, then take him for a long hike or walk on weekends until you’re both ready to drop. It’s good exercise for both of you! If you’ve ever known someone who isn’t happy unless he’s busy all the time, then this is that person in dog form. His playful nature makes him a joy to be around children. However, as with many other breeds, he can become a bit overexcited, so you must supervise him when he is around toddlers. He may just knock them down and accidentally step on them without realizing what he’s doing. The Red and White’s pointing and retrieving abilities are equally matched with his impressive sniffer. Together, the two make him a reliable hunting dog. You can also rely on him to be a good watchdog, though a guard dog he is not. He just doesn’t have the necessary protective instinct. Irish Red and White Setters almost became extinct, thanks to an American and Irish preference for solid red setters. However, one particular family, the Rossmores in Ireland, has been able to keep the breed going since the mid-18th century. In fact, over the course of the breed’s history, some referred to Red and Whites as Rossmore Setters! 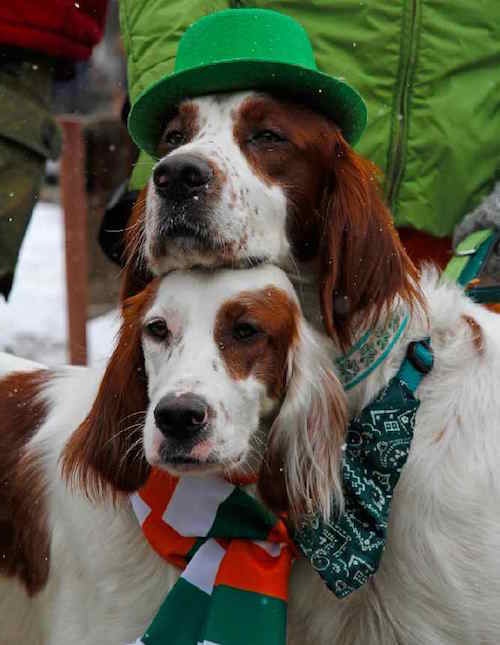 A few other breeders, along with the Rossmores, have been able to produce enough Irish Red and White Setters to keep the breed alive and thriving. This one can be a bit of a challenge to train. You must keep his training sessions short, positive, and interesting. He loves to please his master, so that’s not a problem, and he responds best to a training approach that involves an abundance of praise and positivity. For help with training, you Irish Red and White Setter take a look at The Online Dog Trainer by Doggy Dan. Doggy Dan is an expert Dog Trainer based in New Zealand. His online resource contains Hundreds of Excellent Dog Training Videos that will take you step-by-step through the process of developing a healthy, happy well-behaved dog. When it comes to the Irish Red and White Setter, shedding isn’t too much of a problem. Brush him about once a week to smooth out his tangles and remove any dead hair. He’s one of those dogs that looks the best when you leave his coat more natural-looking. You can use scissors or clippers occasionally just to trim him up and help him look neat. Check his ears weekly for any excess wax or dirt and give him a bath about once a month to keep him smelling clean. The Irish Red and White Setter is one of the more active breeds out there, so you want to exercise him regularly. You’ll be doing both of you a favor if you take him out for a long walk and play with him a bit in the yard every day. Else, he can develop cabin fever and become a real pain to live with. You want to be careful, though, when he’s still a puppy about over-exercising his developing joints. Stick to walks and yard play while he’s young and let him take breaks when he gets tired. Once he’s around 18 months old, he should be ready for the harder stuff. Now you can take him along for long hikes or bike rides. The Irish Red and White Setter's life expectancy is between 10 and 13 years. A Serious Note: Few things are more important than our Health. It's no different with our Dogs Health. Some visits (and Money) to your Vet can be avoided if only you know what to when your dog is ill. The Ultimate Guide to Dog Health is the answer. No dog owner should be without this handy guide. It's no substitute for your Vet but it will Save you Money. And it will help you quickly understand and recognize symptoms before they become a serious problem for your dog. So you'd like to add an Irish Red and White Setter puppy to your family. Mazel Tov! You can either purchase one from a breeder or adopt one through a rescue or adoption organization. The average Irish Red and White Setter price is around $1,000. The price of an Irish Red and White Setter for sale may change based on the breeder you choose, or if you even decide to use a breeder at all. If you want to adopt a Red and White, you may be able to find one through a rescue organization or a shelter. You may prefer to adopt if you are not into the whole training thing and want a dog who is already housebroken and less destructive. If you’re in the market for a good breeder, you may want to check out the webpage for The Irish Red and White Setter Association. There is only a handful of breeders listed for a handful of states, but if you live in one of these states, then you’re in luck! Else, you can add them to your list and contact them with any questions you have when trying to decide if this is the right breed for you. Conclusion: Why the Irish Red and White Setter? The Irish Red and White Setter temperament is a spirited dog for sure. He’s a ball of energy who thrives on daily exercise – the more vigorous, the better. Just keep things light while he’s still a puppy. You shouldn’t run him too ragged until he’s about 18 months old; after that, though, have a ball! He’s a loyal dog who loves his family and gets along with most dogs, and sometimes even cats. He doesn’t require a lot of grooming, though he can be a bit of a challenge to train. He has an average life expectancy for a dog, and he doesn’t have too many major health problems that you would need to worry about. You will bring out the best Red and White Irish Setter temperament and develop a healthy dog if you give him the exercise, love and training he needs. Previous post: Puli Temperament (Energetic, Agile, & Loyal): BUT… Newbies Beware! !